In the last months of 2017 a limited number of passengers flying out of Amsterdam’s Schiphol Airport had the opportunity to participate in the Personal Security Pass program trial. During the two week experiment that lasted from November 28 until December 11, travelers were able to book specific security screening times. Schiphol hopes the program will reduce the amount of time passengers spend waiting in line for security screening. During the trial, participants made appointments on the airport’s website or via the Schiphol App. Reservations could be booked starting 4 days before a flight and could be made up until 75 minutes before departure. Participants could make arrangements for groups of up to five people traveling together. The airport did not charge for the service. Passengers with a reserved time slot began the security screening process at desk A1 of De-partures 1. Travelers presented the QR code received via email during the reservation process. Both smartphone images and printouts of QR codes were accepted. Airport employees verified passenger details and if everything checked out, travelers scanned their own boarding passes. Passengers then had access to the dedicated Personal Security Pass lane. Only one Personal Security Pass lane was open during the trial period. All participants in the program were required to begin the security screening process at the A1 security desk in De-partures 1. Passengers traveling on airlines with check-in desks located in Departures 3 faced walks of up to 10 minutes to begin the security screening process. The trial had a number of restrictions that limited the number of participants. Only passengers flying to the 26 Schengen countries were eligible to book security screening time slots. Ap-pointments were only available for individuals flying between 10:00 am and 1:30 pm. Travelers flying on Ryanair or easyJet were excluded from participation. The plan was designed to screen a maximum of 30 passengers per 15-minute time slot and a total of 400 travelers per day. The theory behind amusement park and museum timed entry practices inspired the develop-ment of Schiphol’s online security screening booking service. Popular museums and busy amusement parks often utilize timed entry systems to minimize long waits. “There it’s been normal for years to reserve a time slot for an attraction or exhibition,” explained Daan Van Vroonhoven, Schiphol’s manager of security, to the Algemeen Dagblad. In May 2017 long waits at Schiphol’s security check points caused dozens of people to miss flights. Airport crowding issues resulted in a number of flight delays and KLM was forced to reschedule several flights. KLM demanded millions of dollars worth of compensation from the airport. 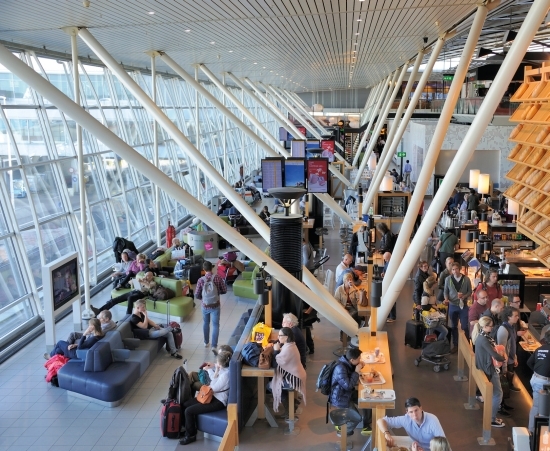 The Personal Security Pass program is just one of several steps the airport is taking to make Schiphol more traveler friendly and to limit the amount of time passengers spend waiting in line. The airport hired more employees and introduced security lanes for passengers with just carry on luggage. Sixty-seven new 3D scanners were added in 2017. The airport also began posting waiting times at security live online. And the Dutch government allocated funds to permanently increase the number of border guards at the airport. During the two week trial period in 2017, the airport tested the Personal Security Pass pro-gram’s ability screen passengers at the allotted time. “Although we have an uncertainty margin built in, unforeseen complications can always occur. This is one of the reasons why we also do a trial first,” explained Van Vroonhoven.